A well-designed drawer is integral to the flow of your home and your workday. Drawers and their slides should complement the material of the furniture and highlight the style of the room. The right drawer slide melds function with fashion, and aesthetics with durability. Drawer slides come in many varieties, shapes, and sizes to blend these areas of life. 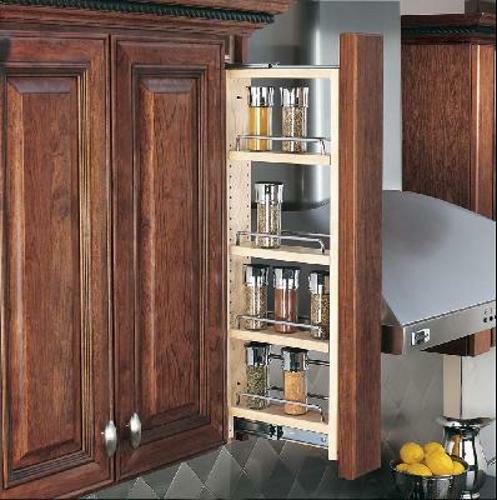 They accommodate all types of purposes from industrial cabinets to silverware storage. How do you know which specific design of drawer slide is best for the drawer you’re building? But where to begin? Here you will find everything you need to know to familiarize yourself with the varieties of drawer slides. We cover everything from their appearance and mount type to their weight rating and motion options. Material options and slide measurements also have a large impact on drawer slide options. Once you understand these choices, you can confidently determine the best type of drawer slide for your next project. Wooden drawer slides are an elegant choice for decorative and infrequently used drawers. Spots like the bedroom or living room benefit from wood drawer slides, holding objects that are only accessed once or twice a day. This material is often not ideal for long-term durability for drawer slides that will be heavily used, as it warps over time and can expand in ample humidity. When a drawer requires maximum longevity and durability, metal drawer slides are your best bet. Metal options feature a variety of extension choices and weight ratings, all of which should be followed to avoid warping the metal. Some designers feel that metal slides take away from the visual appeal of the drawer. For dependable smoothness and strength, this is the material to choose. Plastic drawer slides offer the largest color variety, so you can coordinate them with any design. However, most plastic slides will not last nearly as long as metal or wood slides, so plastic is best for short-term fixes. The appearance can detract from the quality of the item. When seeking a purely budget-friendly option, plastic will do the trick. When it comes to the DIY hobbyist, we’re probably talking about heavy tasks with tons of use. Finding the right drawer slide is key. Even though manufacturing diminished in America; hobbyists, outdoorsman, and preppers haven’t reduced in their creativity one bit. Whether you’ve committed to making the “greatest” armoire ever or just fixing up your workshop, most people opt for a heavy-duty drawer slide that is able to hold whatever you throw at it. For even more demanding tasks, there is an incredible set of locking drawer slides we’ve seen used in ambulances, helicopters, yachts. We even used these slides to create excellent pullout toolboxes for trucks or generators for RVs. These drawer slides are usually the go-to for most makers out there. Now when it comes to your kitchen there are a few factors to gauge. You’re either dealing with whatever was installed when the house was built or have recently done a remodel. If you’re in the first bucket, then there’s probably a massive amount you can do to upgrade your kitchen or bathroom into a place of luxury. For ultimate sleek design, we recommend undermount drawer slides. You’ll probably only end up adding these custom if your existing slides are already broken. But many homeowners who are obsessed with aesthetics love them. The modern favorite that everyone loves is soft close drawer slides -- no more jangling or slamming! Another time-tested option is overextension drawer slides. These are great if you can never seem to find anything as they allow you to search the complete contents of a drawer like a full extension drawer slide would. But they also can get over the lip of any countertops that might obstruct the view. Salt, salt, and salt everywhere! If you live on the coast, or like boating, you know how corrosive salt can be to your possessions and home. Sugatsune creates some of the highest quality stainless steel drawer slides on the market. If you need replacement drawer slides on a boat, coastal home, or for any marine applications these stainless steel drawer slides have always been my go to. Most commonly used these days, side mounts are exactly what they sound like—one mount on each side, halfway up the side of the outside of the drawer. A side mount provides balance and strength, making it a long-lasting option for drawers that take on a lot of weight. Side mounts also allow the drawer to sit flush with the bottom of the cabinet. A budget-friendly option, it comes in a variety of materials and colors. The downside here is that dirt can become trapped in the exposed slides, making it unseemly on the eye. Lining the midway point along the bottom of the drawer is the center mount. This is one of the oldest options in carpentry when it comes to slides. A single slide means less money, but it also means a lack of equilibrium. Center mounts should be used on drawers with lighter contents. A more stylish choice, the undermount features two slides on the drawer’s base, placing them out of sight while supporting greater weight. Undermounts are now the go-to for classy kitchen and home cabinets. Their combined durability and discreet positioning do make them a bit more expensive however, and because they take up more space, are not ideal for particularly deep drawers. Think silverware drawers or more stylish top drawers in desks. Drawer slides are more than just drawer supports. When you need a smart space for working or serving food, top mounts attach to the top of a sliding surface to extend a desk or table. Top mounts are commonly used in electronic trays and pull-out surfaces. This is one of the trickiest factors when choosing a slide mount. Once you’ve selected the correct mounting position, material and weight rating, you can begin to measure. Most drawer slides lengths range between 10 and 28 inches, in increments of two to three inches. Measuring your drawers properly determines if the drawer will balance correctly, sit flush against your cabinet, and withstand frequent use.Before you begin, determine if your cupboard is a frameless, euro-style cabinet or the more common face-frame cabinet—this will define where to begin and end your drawer slide measurement. First measure the width of the drawer. Next measure the cabinet space where the drawer sits. If the drawer is 12 inches wide and the cabinet is 13 a half inches wide, then you have a half inch to work with between the two slides. Please note, the drawer’s face may be wider than the drawer itself. Once you know your available space, choose the correctly sized slides. Each slide should be no wider than a half an inch each. When in doubt, go thinner. You can always add a small shiv of wood or support if necessary. Always choose the drawer slide that covers as much length as possible without going longer than the drawer itself. This provides proper support throughout the drawer. You should determine this by measuring your cabinetry length, not the old slides themselves. In most cases, measure from the inside of the back of the cabinet, up to the inside of the drawer face. Subtract one inch to find your ideal measurement. The height of your drawer slide is primarily important when installing a very short drawer or extendable working surfaces, such as a spot for silverware or desk supplies. A tall slide mount meant for large, industrial storage areas may be too tall for a small wooden drawer such as these. Also, consider mount height when choosing the best weight rating. Determining the correct width has more to do with weight distribution than installation. For example, this measurement comes into play when considering file cabinets or other drawers where height is longer than the width. Many common drawer slides are not equipped for this type of load, so it’s important to find the proper type when searching for this particular need. Also, in general, the wider the drawer, the less weight it should carry. Check out their weight rating for more detail. Most important to any installation project are the materials’ durability and longevity. When your drawers carry heavy loads or are moved around frequently, you’ll want higher weight ratings. Slides’ weight ratings usually range from 75, 100, or 150 pounds. Specialty weight ratings are also available, especially for industrial varieties.Keeping physics in mind, longer slides will tend to have lower weight ratings, while shorter ones with less-wide drawers can hold more weight. It is also dependent on whether your drawer plans to take static or dynamic loads. This is the amount of weight a drawer can hold without buckling when the items are stationary. It is often higher than the dynamic load. 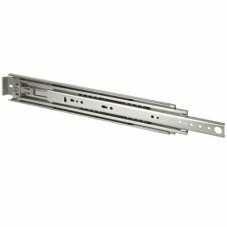 Drawer slides come in a variety of extension options, catering to all room sizes, drawer face designs, or needs. The three common choices are three-quarter, full, or over-extension slides. When determining the correct drawer extension length, first measure the inside of the cabinetry—taking counter overhang or drawer face into account—and gauge how far you need the drawer to extend. Three-quarter extension slides are ideal for the most commonly used home drawers. These retain support while remaining partially inside the cabinets, and safe space. This is best when you do not necessarily need access to the back of the drawer. Most ideal for busy craftsman, a drawer that fully extends allows quick and full access to the back of the drawer. It is best for areas where space is not an issue. This way, you never need to reach far back into the cabinet to see any item. It is also best for filed and larger objects that are accessed often. When wide countertop lips extend over drawer access, over-travel slides provide full access to the contents of a frequently used drawer. Over-travel drawer slides push the drawers past the cabinet itself, welcoming full access even with a lip or overhang in the cabinet design. Many drawer slide options allow you to take your cabinetry to the next level with just a little extra expense. The following features also extend the longevity and usability of the slide. Rushing around throughout the day, it’s easy to ignore how often a drawer is slammed. Sometimes you have to just keep moving. Installing shock absorption options extends the life of both the drawer and the cabinets. For stylish, handle-free drawers, install a push-to-open feature. These push-drawer slides are great for areas with minimal space or a sleek aesthetic. Maybe you don’t want to worry about exerting the perfect amount of force to close a drawer safely and quietly. Slide close drawers take care of the closing mechanism with just a simple nudge. This is also great for small children or areas where you’d like to protect the integrity of the cabinet surface. Similar to the slide close drawers, these slides catch themselves just before the outside of the edge of the drawer. You can exert all the force if you wish, but the slide will slow things down right before slamming. Drawers play a huge part of your daily life. Once you’ve gone through the process of installing and designing the perfect drawer, you will notice how they keep our lives in motion. By considering the measuring logistics, appearance, cost, and durability, you are sure to find the drawer slide that is perfect for your project. Drawer slides can be customized to many different home arrangements and storage solutions. It’s all about finding what’s best for your space and storage needs. Contact us today if you want to find the perfect drawer slide for your next project.